Description: Though called a codex, the pages of The Ialdabaoth Codex are made of vellum, appear quite old and are slightly discolored with a sickly tinge, as though the animals from which the skin was taken were of an unhealthy pale color most often seen in subterranean creatures. The book itself is of Atlas folio size (approximately 25 inches tall). 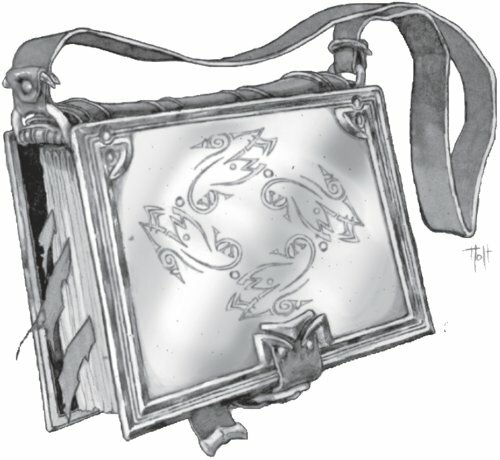 It is bound between two sheets of beaten brass, with Atlantean sigils burnt into its surface by what appears to have been a stylus heated red-hot. The sigils themselves are unknown to modern magi, though they bear some resemblance to wardings and the kinds of runes used to extend the duration of various Death or Spirit magics. The cover itself closes through the use of a thick leather strap and buckle, and is incredibly chilling to the touch. Three silk ribbons are sewn into the spine of the book. Having seen years of use as bookmarks, they are now tattered, threadbare and faded. At the top and bottom of the spine are set brass D-shaped rings. Throughout the ages, lengths of chain, robe, silken cord and other similar devices have been attached to these rings, allowing the book to be carried bandolier-style across the chest, or hung from a belt or saddle for easy transport and quick access. The name Ialdabaoth Codex does not appear anywhere on or in the book, it should be noted. This is simply the name given it by Mysterium scholars through the years. The Ialdabaoth Codex is divided into three distinct sections. The edge of the pages in question are tinted to Supernal Vision — “Pleromaic Outcasts” seems to radiate a strange green-black hue, “Saklastic Archons” a deep brick-red color and the pages of the “Ptahilistic Unquiet” emanate a luminous grey-green that looks like nothing so much as seeping, tainted ectoplasm. This spell works like the Forces spell “Fiery Transformation,” save that instead of turning the caster into a creature of fire, it allows the caster to turn his physical body into a spiritual one. At Life 5 it can be used on a touched target, transforming their living body into immaterial ephemera.